Modify this skate in the CUSTOM SKATEBUILDER! – Unibody construction with lightweight one-piece shell, soulplate and frame. – Aeon soulplate: perfectly shaped groove, reduced friction due to offset soul sliders, same width plates for controlled cess slides, optimized plate-frame angle. – MYFIT Skinny Boy Dual Fit Liner: 100% heat mouldable, adjustable, anatomical ankle padding with perfect heel lock, thin & stretchable front part, comfortable thick padded ankle part, laceable top part. 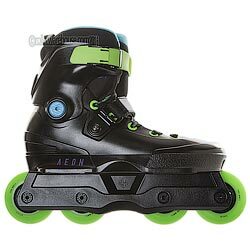 – USD Aeon wheels: USD 72mm 88A SHB speed profile wheels. – WCD Abec 5 bearings: 7 Freespin chrome steel balls, 2RZ rubber coating, synthetic oil. Once the decision to create a new aggressive inline skate had been made, we had to be sure that it would stand out from the crowd. We decided to break the rules that have been abided by for the past 14 years, and think outside the box – why does a skate need so much hardware? Is UFS really the best solution? You heard right. This skate is not UFS Compatible. Are we crazy? Consider this: UFS was invented as a standard mounting system many years ago and is optimized for a maximum wheel size of 60mm. But since its creation, larger wheels such as 72mm have become popular again, a wheel size that reminds us of the popularity of OG blading roots, allowing better roll while enabling great control and space to grind. Sizing Chart below is specific to USD Pro Aeon's. True to size fit. Average width.